Berlin. Lufthansa flight LH2049 was actually unapproachable. Straight down from second place of the podium at the German Open Dimitrij OVTCHAROV sprinted with his gym bag over his shoulder, the Cup in one hand and a winner’s check in the other hand out of the venue Max-Schmeling-Halle and into the shuttle car of Monika WITTMANN that was waiting for him just outside the back door of the Arena. The lady from Frankfurt had an actually impossible task: she had to drive 9 kilometres through Berlin on a busy Sunday evening with many red lights to Tegel airport within 20 minutes. OVTCHAROV had his holiday flights booked for himself and his fiancée, the Swede Jenny MELLSTRÖM, for 6.55pm -from Berlin to Dubai via Munich. They planed to spend 8 days of recovery paired with OVTCHAROV’s light training. This is the annual vacation of the 25-year-old world’s number 5, European Singles Champion and German Open finalists. Every minute for relaxation is precious, a whole day even more, and Dima would certainly have lost at least a complete day if he had missed that plane. “We used every gap that opened up and drove by some deeply green traffic lights. After 8 days of work at the German Open I could even drive the route eyeless,” Monika WITTMANN quips. Even hours later she is still completely exhilarated. In real life, WITTMANN could be a racing driver, but she earns her money (for now) working with the administration of the city of Frankfurt am Main. This lie might not have been necessary because: “The people at the Lufthansa counter were very nice and did everything that was possible, to let Dima catch the plane,” adds OERTEL, who is with the national public service old-age pension in Berlin. So the luggage was already checked, but only loaded when Dimitrij OVTCHAROV had entered the airport. In particular, the gate for the special passenger remained for once open until departure. “They were 2 people at the check-in. The man was relaxed, enduring my chatter and finally said, Oops, now he is checked in’”, says OERTEL. Meanwhile in the car Dimitrij OVTCHAROV, who had over and over again informed Jenny via phone about his distance to the airport, did not stay in the car for any second longer than he had to. “When we arrived at the airport, is Dima almost jumped out of the car while driving. I have only seen a shadow running into the airport,” Monika WITTMANN describes. Well, another celebrity was on board on time and had to wait a moment. “It was said that Horst SEEHOFER was already on board,” say the 2 shuttle service volunteers. “And now must wait for Dima.” Fortunately, it was not for too long. Table tennis perfectionists OVTCHAROV succeeded, too, in this respect with a precision landing. Mr Horst SEEHOFER is one of the leading German politicians, Prime Minister of the county of Bavaria and chairman of CSU party, the regional sister party of chancellor Angela Merkel’s CDU. 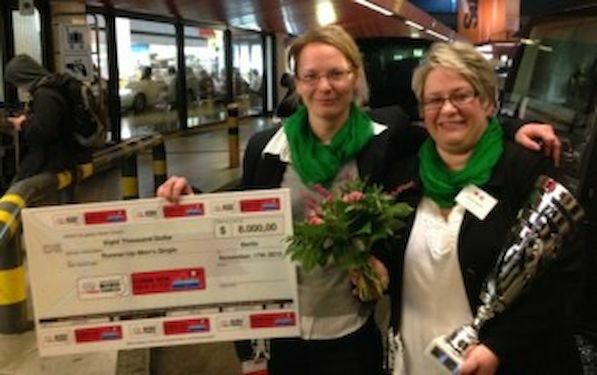 Because SEEHOFER was already on the plane, a member of his security staff, who had remained at the airport was relaxed and had time to shoot a photo of the ladies WITTMANN and OERTEL holding the oversized winner-show check of OVTCHAROV’s and his cup. Both things were namely too bulky for hand luggage. For the volunteers who support the German Table Tennis Association at major events since 2010 in their spare time, this picture was an added bonus. Back at the venue they immediately handed check and cup over to the DTTB to keep it for its owner.